For Canadian playwright Trina Davies, staging a public reading of a new work is an invaluable part of a play’s development. Set in the aftermath of the Bosnian War, The Bone Bridge follows several characters who struggle to move on with their lives and reconcile with both family and neighbors. When the charismatic ‘Leader’ is captured and charged with war crimes by an international tribunal, the characters are called to confront the past and testify at the trial. Relevant and insightful, The Bone Bridge is a poignant reminder of the invisible damages of war. Davies shares what the research process looked like in developing the play which is based off real people and events. For first place, Davies’ play received a two-day workshop, followed by a public reading which was held at U of C’s F.R Matthews Theatre on Dec. 12th. After the reading, the audience was invited to ask Davies questions and to share their responses to the piece. Audience members were later invited to a reception where they could speak with Davies one-on-one. The actors who participated in the workshop and reading, Davies says, were also very important in terms of feedback. The input from both the actors and the audience have helped give Davies an idea of how she wants to move forward with the script, but still, she says, the play’s future remains uncertain. But Davies says the audience’s response from the reading has left her feeling encouraged. 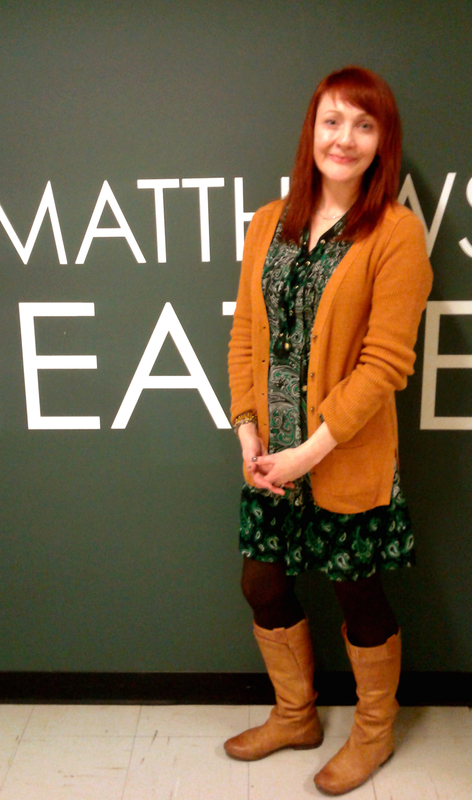 The staged reading of Trina Davies’ The Bone Bridge was held at the University of Calgary’s F.R Matthews Theatre, December 12th, 2014.